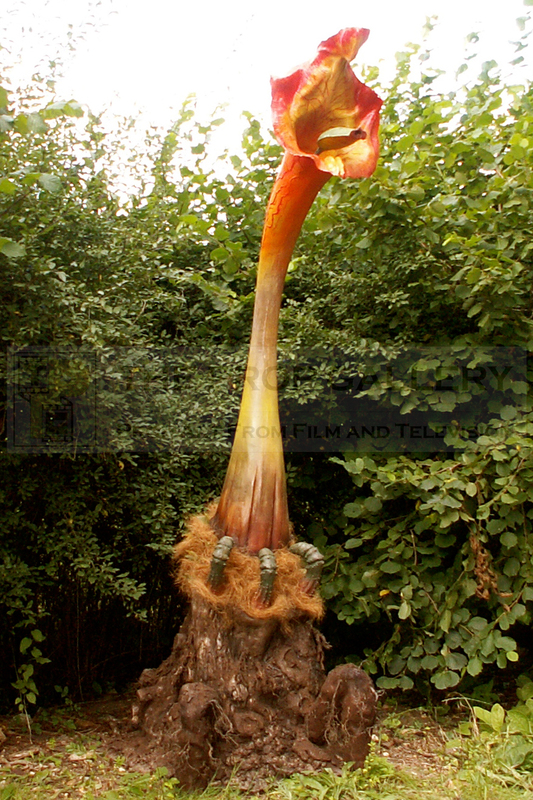 The Day of the Triffids is a BBC television adaptation of the classic post-apocalyptic novel of the same name written by John Wyndham which was first published in 1951. The brainchild of Blakes 7 producer David Maloney with scripts from the pen of Douglas Livingstone it remained far more faithful to the original novel than the 1962 feature film, it was broadcast in six 30 minute episodes first airing in the autumn of 1981. Starring John Duttine as Bill Masen and Emma Relph as Josella Payton under the direction of Ken Hannam the series is set in 20th century England following a meterorite shower which renders the majority of the population blind leading to the breakdown of society as people know it. 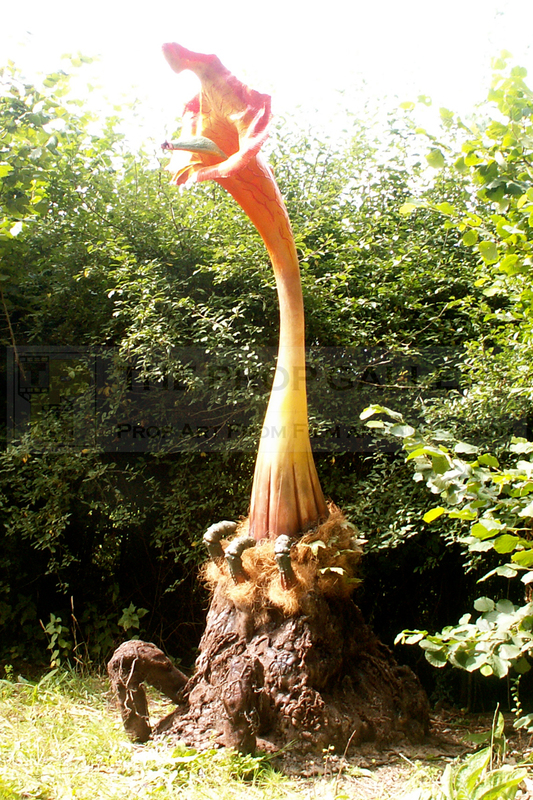 A hostile and carnivorous form of plant life, the Triffids, prey on the weakened and vulnerable and begin to establish themselves as the dominant life form in the country. Handling the effects for the series was BBC Visual Effects designer Steve Drewett with whom Maloney had collaborated on Blakes 7, Drewett drew on his experience from the Natural History Museum basing his design of the Triffid on real parasitic plants with a total of eight full size props being constructed for the production by the BBC Visual Effects Department which included an under control version for use in close ups. 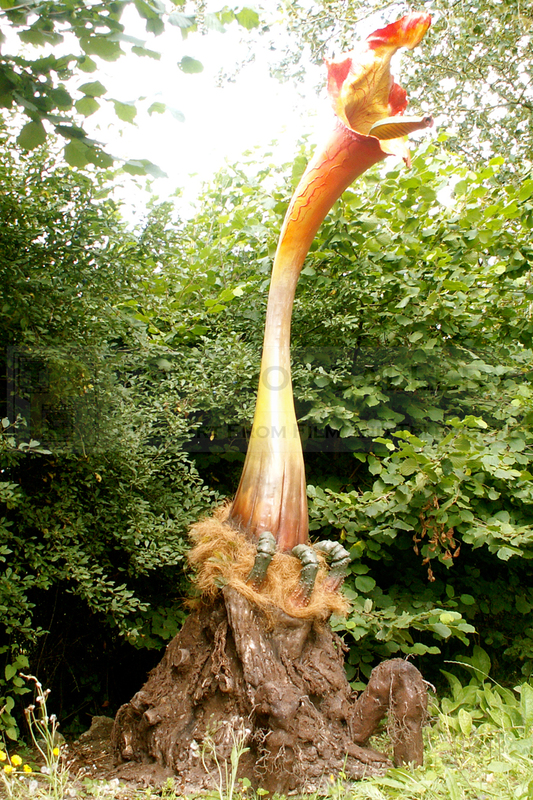 Each of the full size Triffid plants were constructed around a go-kart seat on which the operater would sit to manoeuvre the Triffid, concealing this seat was a large root, cast in latex it was dressed and textured with all manner of things including real roots and soil. From this root comes a large flute like stem constructed from fibreglass, this originally housed a concealed fan in order to keep the operator as cool as possible as it would be virtually impossible to stay inside the prop for any length of time, on top of this stem a flexible rubber flower was added with an internally housed stinger which could be operated from the interior. 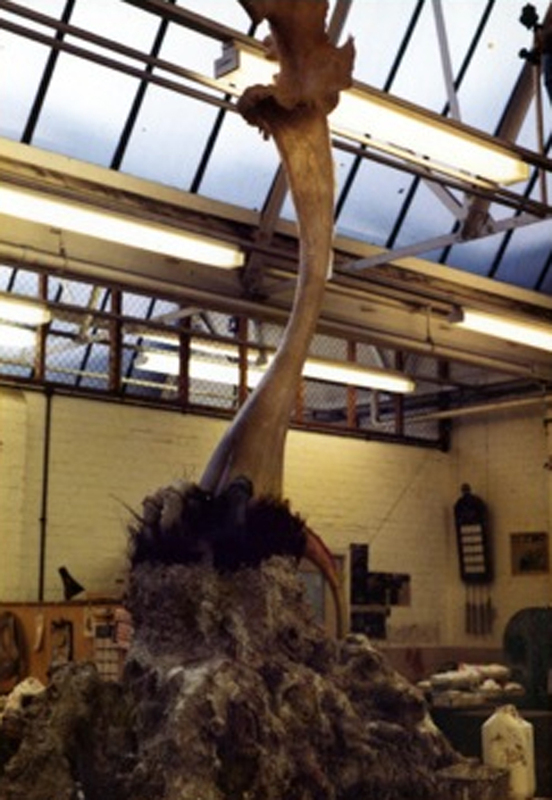 After the production two of the props were displayed at the Natural History Museum with the remainder believed destroyed. This particular example was in storage for many years until the BBC Visual Effects Department closed its doors in 2003, although reasonably complete it was in poor condition and so in 2012 a sympathetic restoration was carried out. 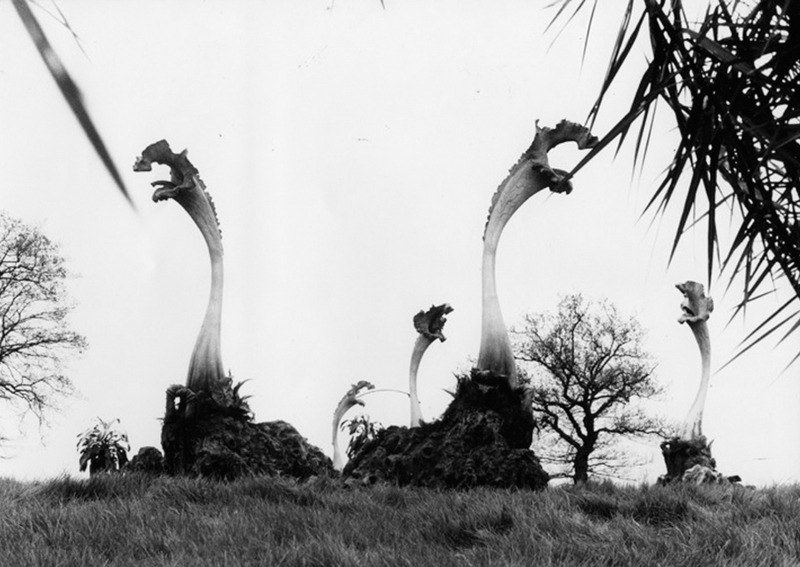 Techniques similar to the original build were employed to restore the Triffid to its former glory. Many hours of research using all available reference material were carried out whilst also liasing with former BBC employees to guarantee the final result was as faithful to the original props as possible. 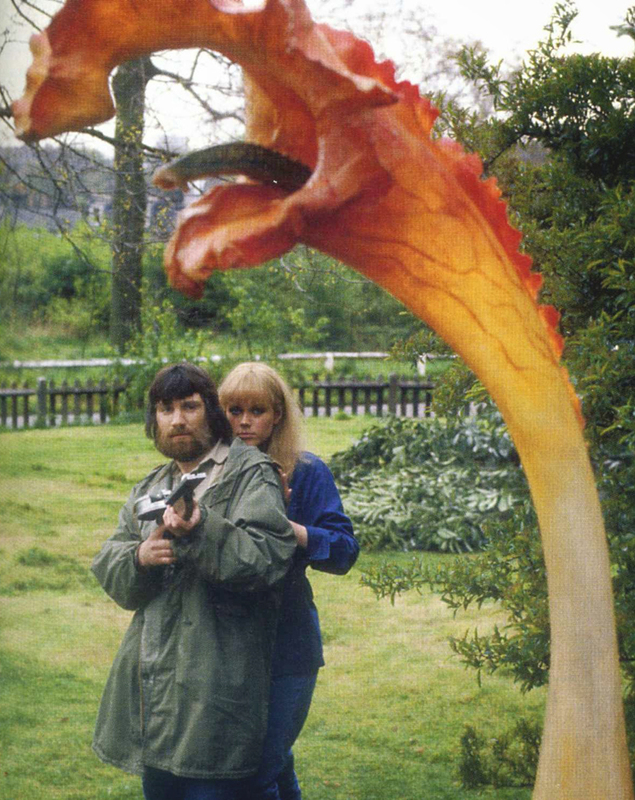 Standing over nine feet in height the prop makes an imposing display piece and always an interesting talking point, believed to be the only survivor of the original full size Triffid plants it represents a significant artefact from this highly regarded BBC adaptation. 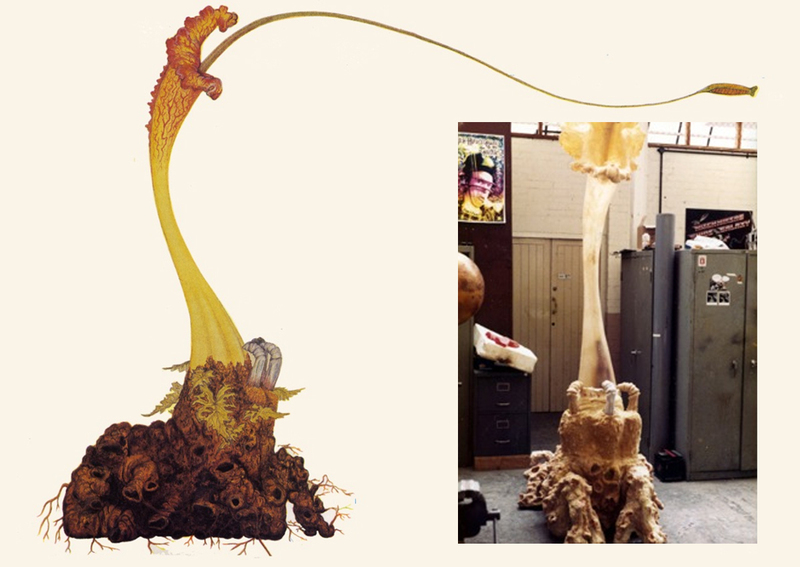 Above left; Steve Drewett's original design for the Triffid plants and inset one of the props under construction behind the scenes at the BBC Visual Effects Department. Above right; The full scale Triffids on location. These images are reproduced here with the kind permission of Steve Drewett. 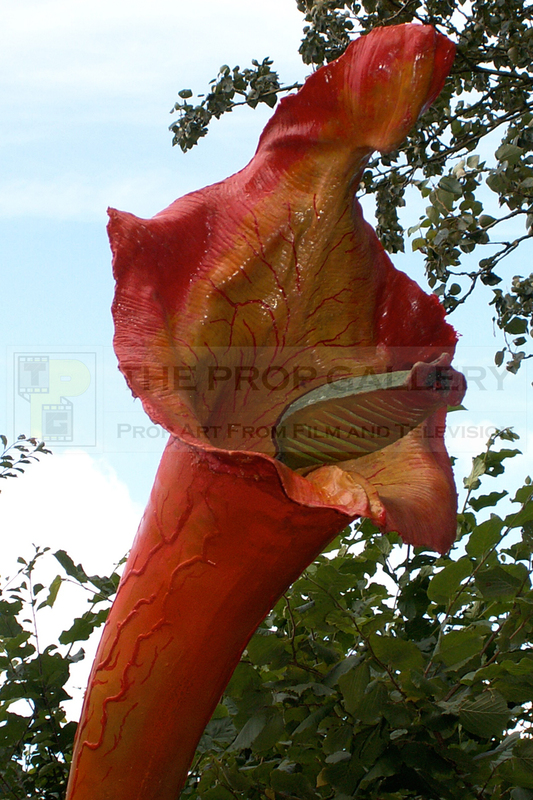 Below; The original Triffid prop as it looks today.